Hamilton Princess & Beach Club will again host ‘Yelloween,’ a Halloween costume party to be held at the Hamilton Princess Beach Club on Saturday, October 28. It gets its name from the distinctive yellow of Veuve Clicquot, which is sponsoring the event. This will be the last opportunity for visitors to check out the Beach Club for the year, with no further events to be held at the venue until 2018. The event will begin at 8:30pm and continue until the small hours. Live music will be provided by DJ PM and DJ Holmes and there will be a dancefloor. Prizes will be awarded on the night for costumes, including Best Dressed. Tickets for the event cost $45 and include a welcome glass of Veuve Clicquot and canapés. These tickets must be purchased in advance and are available here. 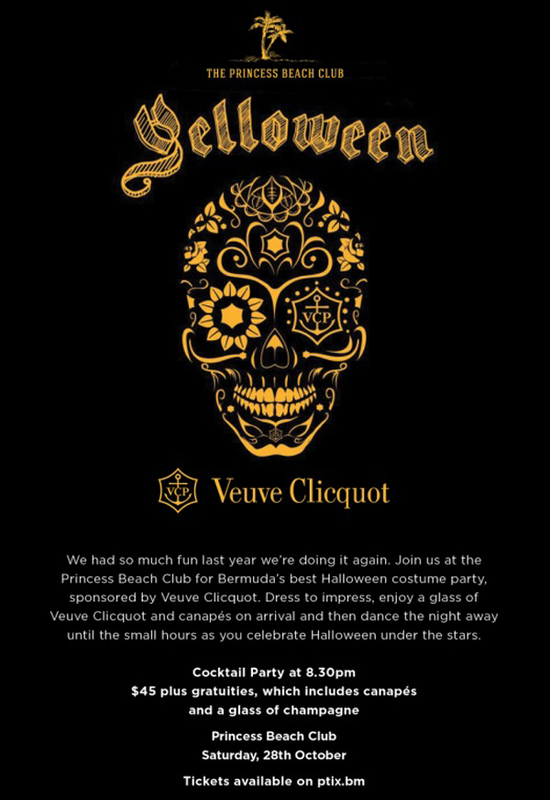 “We are delighted to be hosting Yelloween again and to be closing out the Beach Club’s 2017 season with a bang,” said Diarmaid O’Sullivan, Director of Marketing at Hamilton Princess & Beach Club.